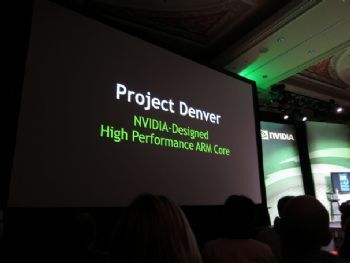 At the tail end of their Tegra 2 press event, Nvdia CEO Jen-Hsun Huang quietly dropped something of a bombshell -- Nvidia's "Project Denver." Working in concert with the folks at ARM, Nvidia has obtained the rights to build their own CPU based on ARM's future processor architecture. They're directing their efforts at powering personal computers, workstations, and supercomputers, with high-performance chips that are integrated onto the same chip as the Nvidia GPU. This development makes an increasing amount of sense in light of Microsoft's recently announced plans to support System on a Chip (SoC) architecture in the next version of Windows. As Huang mentioned at the Tegra 2 press briefing, there's been a marked shift in exactly who is pushing the nascent computing-revolution. There was a time PC manufacturers lead PC innovation. Today, the fastest growing operating systems run on smartphones, and ARM's rising market-share hints at a future where the tried-and-true x86 architecture we've known for so long won't be the industry mainstay. More importantly, it's yet another sign that Nvidia is ready to move into a bigger pond. The company may be making a push for the mobile device market with their Tegra 2 initiative, but they're primarily known as a graphics card manufacturer, specifically catering to bleeding edge, enthusiast level gaming. Still, consider Apple's tech empire; you don't get to be on of the most successful tech companies around by sticking to what you know. With Tegra 2 working its way into smartphones and tablets, and an ARM-based CPU in the works, Nvidia-developed phones, tablets, and PCs aren't really too far-fetched. Check out our complete coverage of CES 2011.